OPINION: Controversy surrounds Mount St. Mary’s one point playoff victory over the St. Francis Terriers, after it was revealed by Timothy Burke writer for Deadspin.com that Mount St. Mary’s had six players on the court during THE crucial moment in the final seconds of the game. In the video posted by Burke on Deadspin’s website (link below) it shows the Terriers led by three with 28.7 seconds left to play in last week’s playoff game against the Mount St. Mary’s Mountaineers and all the Terriers needed to do was inbound the ball and knock down some free-throws. Inbounding the ball is no easy task in high pressure situations — and it is even harder to do with six players on the floor for the opposing team. 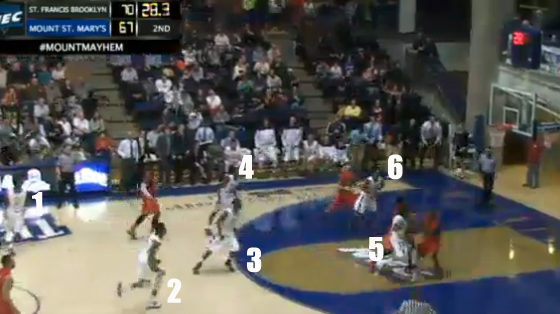 The video provides proof that during this pivotal moment of the game the Mountaineers had six players on the court and would go on to steal the inbound pass and convert to cut the lead down to just one. They would ultimately go on to win the game as well as the entire NEC tournament, punching their berth into the NCAA tournament. This should not have been the case because if the right call had been made by the officials, the Terriers would almost certainly gone on to win the game and advanced to the next round of the playoffs. A call that is so basic and obvious, essentially changed the course of history for St Francis College. Who knows what the Terriers whould have done if they advanced to the next round? What makes matters worse is that a week went by until the 6th man non-call was made public — and it took a reporter to make it public. St Francis College should be causing a stink about this and demanding a replay. Can you imagine Rutgers or Long Island University just meekly accepting that they have been wronged by incompetence or worse? St Francis College should be taking this issue to the highest authorities. Our basketball players desserve their support. It is still unkown what the outcome of this debacle is going to be. What is certain is that Mount St. Mary’s got a clear assist from the officials and probably would not be in the NCAA tournament right now if the game was called correctly.